Our representative deals with many travellers who tried to enter in Canada but inadmissible to Canada due to their criminal record. If you are influence of alcohol, reckless driving, any theft offences or controlled substance offences, you are inadmissible to Canada. It doesn’t matter what the crime is consider in your country, what matters is how it classified in Canada. If you have been committed a crime either an indictable offense or a hybrid offense, you are inadmissible to Canada even if you have been convicted of indictable offense or a hybrid offense outside of Canada that consider crime in Canada. 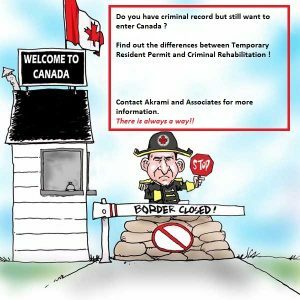 If you committed an offence outside Canada, you may become rehabilitated in two ways, whether, you may apply for rehabilitation or you may be deemed rehabilitated. A certain amount of time must have passed since your sentence time served, probation, or a fine has been completed to apply for deemed rehabilitation. If you never deemed rehabilitated and you committed more than one indictable offence, you must apply for criminal rehabilitation. To be eligible for rehabilitation you have to prove that you lead a stable life and your conviction have not been and will not be involved in any kind of criminal activity. You are technically in admissible to Canada, if you committed crime outside Canada but have not been caught, charged or convicted. Although, it is not possible for an immigration officer to know that you have committed these crimes and to determine that you are inadmissible unless you tell them, it is not recommended that you hide any offence. Hiding important information may be treated as misrepresentation, and it is a crime. You would be considered a low risk traveller. If you believe you may be inadmissible to Canada for any reason, you will need to prepare a strong application, as immigration officers have complete discretion as to whether or not you will be allowed to enter Canada again. Applying for a temporary resident permit or criminal rehabilitation can be extremely stressful and difficult to pursue on your own, because each application is very specific to your given circumstances. Therefore, it is highly recommended that you seek out professional and experienced help before proceeding with the application. Akrami & Associates work and have experience with many different immigration issues. We have helped many of our clients, who have inadmissibility, enter Canada. Please feel free to contact Akrami & Associates at 416-477-2545 for more information, or if you would like to book a consultation with an immigration professional for more advice. With Akrami & Associates, there is always a way!